Produced by Legion Of Universal Soul. Sleeve by Vaughan Oliver, Ian McKinnell and Pirate Design. Produced by Legion Of Universal Soul. Sleeve by Vaughan Oliver, Schoerner, Ian McKinnell and Pirate Design. Coproduced by Dine. Engineered by Paul Doyle, Brian McNeil and Dave Pine. 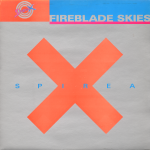 This is the last release by Spirea X on 4AD. «Signed D. C.» written by Arthur Lee.